I recently had the chance to re-read and review Scott Turow’s amazing novel, Presumed Innocent and I was reminded of why I loved this book so much when I read it almost 20 years ago! 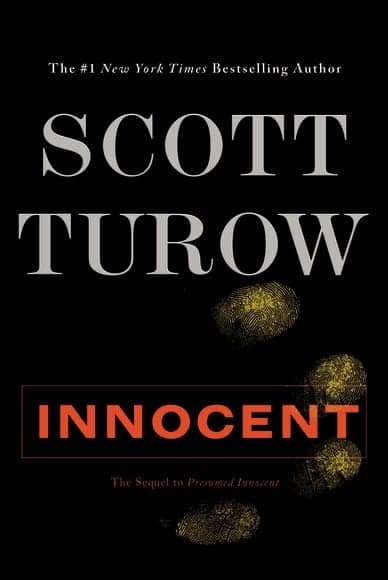 I also had the opportunity to read the sequel, Innocent, by Scott Turow and I can’t wait to see how it compares to the original. I am pleased to say, first and foremost, that this book far exceeded my expectations! I was concerned that, as a sequel, it might provide a huge amount of backstory for anyone who had not read the original book and that it might fall into cliches about sequels and simply be a book that rides on the coattails of the original. Nothing could be further from the truth! This novel could easily be read on its own. Rusty, who is now a judge with plans to run for office, finds himself in the centre of a murder trial again when his wife is found dead and he is the prime suspect. Rusty finds himself facing off against Tommy, who participated in his first murder trial and with whom he’s had a strained relationship for over 20 years since Rusty was acquitted. Certain nuances about the relationship between Rusty and Tommy (the prosecutor) have more depth if you are aware of their previous relationship but Turow does an excellent job of finding a balance between providing a bit of information about their previous relationship without taking up too much time in its discussion. I also loved the development of the character of Nat. As Rusty’s son, he was only a small child in the original novel and has grown into an adult. I love how the book looks at the relationship they have built between them and examines the challenges they have faced as a family. When I first began reading, I was concerned that the character changes and changing timelines in different chapters would get confusing. As the novel progressed, I appreciated why Turow had chosen this style of writing, allowing the reader to develop and piece together the events from different perspectives in space and time. Overall, I loved the novel! It left me questioning how Barbara’s death had taken place until the end of the novel. There are enough unanswered questions and twists and turns that my mind was traveling through all of the viable suspects until the novel’s conclusion. I’m really glad that Scott Turow decided to write Innocent because I felt like I was sharing an experience with an old friend as Rusty faced his demons in this novel. I also must admit that I secretly hope (well, it isn’t a secret now!) that the book will be optioned for a movie and that Harrison Ford will play Rusty again because I think it would be amazing!